After two and a half years of development we are proud to bring you the most comprehensive full scale team effort hack of the original Metroid! 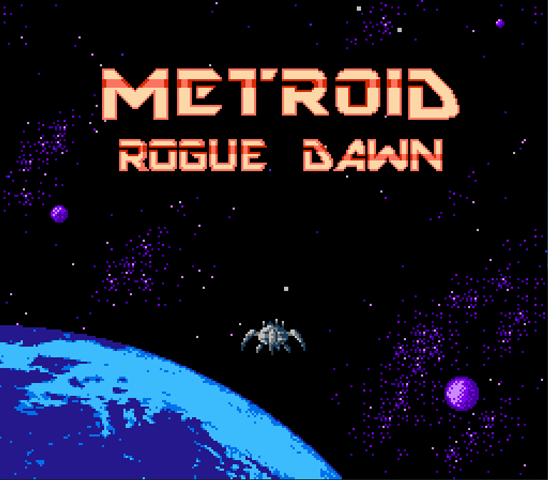 Rogue Dawn is a completely new Metroid game based on the foundation of the original NES Metroid game engine. New graphics, music, items, and countless other modifications! So I've been playing for over an hour and haven't made any progress besides finding a few missile tanks. Any hints? Also is there a recommended emulator? I've noticed that the jump movement gets choppy here and there in nestopia. Holy Cow! The Speed! ^^ Also the game is much more responsive than the original. Oh and did I mention the graphics? Gorgeous indeed! Kudos to the many contributors of this campaign: you are A-W-E-S-O-M-E!! Congrats to the team behind this on a project well done! Just gave it a download and I'm really digging it so far. I'm especially in love with the level design, with the little secret planted right outside the starting room and how the dual access points to the world give the game a nonlinear feel right off the bat. And that map system, wowza! Verve Fanworks: We shall shew thee here the force of our arms! I would recommend using FCEUX. Regarding getting lost have a look at the pause map, there's markers that can help give you direction. There is also now a printable version of the pause map available in our main thread - page one, first post. I would LOVE to have a hack for the vanilla Metroid that had the speed and controls of this hack. If it also had the map and saving would be awesome (the up + a + b saving, not using controller 2 like the Metroid + Saving hack). Does that exist for the vanilla game? Congratulations! Blew past the 3000 mark, currently at 3099 downloads! WHOA! UP TO 7377 DOWNLOADS! NICE! This is amazing and I am very glad that you guys took the time to do this. A long-time wish granted! I like it. Looks very well done. Might put this off for the nes flash cart I'm getting. Congratulations on breaking 10,000 downloads! Thanks, we never anticipated this level of interest, it's been a pretty neat experience. Between RHDN and Metroid Construction we had over 12,000 downloads in the first week!!! We've been getting a lot of great feedback on potential improvements and general bug reports. As a result we're working on a pretty substantial update (version 1.20) that will refine the game and add additional goodies. Most of the changes are complete so we should have the new version up for download pretty soon. I played a couple of hours of it yesterday. Graphics wise I love the animations and how organic everything is. A lot of effort was put into making it feel alien and it shows, it is absolutely fantastic. As for the gameplay/level design it was very good and very metroid like. I wouldn't say this is an entry level title on the series (and it shouldn't be) but I have made progress without much trouble and it was a lot of fun. I really didn't feel like the screen warping you to a different area of the map seamlessly was very "metroidy". It feels strange and goes against the feel of completing a map. Made me feel like the map lost some of its importance. All in all, this raises the bar in rom hacking quality. I'll reserve some time to play it to the end. Regarding the ladders it's just a cosmetic filler, I've considered removing them, I actually did in a few locations before the Beta 3 play testing. I'm not too concerned about them at this point. I know it's on the list of non-Metroidy thing's but I never set out to copy any particular art or design style from any of the official Metroids. Some of the warping has been reworked, I know it's on the non traditional Metroidy design list also but several of them are there for two reasons and can't be (shouldn't be) removed. For one they allowed me to create a much more vast world since the actual grid size you can construct screens on is rather limited. The second reason is that they warp the player back to the beginning after beating the area instead of making them traverse all the way through the way they got there, I wanted to keep the player moving forward. There are three warping areas that don't fall into these two categories and two have been reworked, one to remove the warping, a second to add an alternate path. I think I've addressed most of the complaints in our final update 1.20 (work in progress). Looks like the repro-cart scum are salivating over future sales on this.... Already see carts for sale.. This hack is starting to go viral on the web being headlined as a "fan game". ...You know what that's going to mean.